The ride to Lawrence, home of the KU Jayhawks, was Kat’s trip all the way. She found the campsite online, drove all 200 miles, and did a fairly good job of disguising her anger at my failures of navigation. I failed with the maps because of a detour that blew up her hand-written instructions and led me to rely on our GPS. We drove an extra 15 miles in a Kansas circle (that’s a square; the roads almost all run east-west or north-south). Along the way the flatlands turned into what Kansans call the Flint Hills. That happens around Fort Riley, home of The Big Red One, the US Army’s First Division. Riley is an armored warfare center in the middle of American tank country. The hills are big enough to hide several tanks or a battery of big guns, yet the land is open enough for large scale armored maneuvers. If you are not retired you won’t believe that we who are run out of time to do the things we want. I would have liked to visit the Cavalry Museum near Fort Riley. I don’t know that there is much there; what could be? Sabres, sidearms, carbines, maybe some Sioux or Comanche artifacts? We had seen the Eisenhower Library earlier in the day: that’s enough diversions for one trip. We drove past. Along the way we noticed half a dozen cemeteries right there on the edge of the highway. In the last one we were going slow enough to notice a huge red granite tombstone engraved with the name WAGSTAFF. I wondered if this could be the grave of Simon Wagstaff, the hero of Kilgore Trout’s only novel, Venus on the Halfshell. Then I remembered that Simon became immortal in Halfshell and would never require a tombstone. For those of you who are not especially conversant with the work of Kurt Vonnegut, Kilgore Trout is the principal character in Breakfast of Champions. Vonnegut wrote Halfshell as Kilgore Trout, either for fun, or to get to know his character. It’s the story of a space traveler and his life-long journey from one oddball planet to the next, always in search of the Creator. Simon yearns to find the answer to life’s most persistent question: “Why was man born to suffer and die?” At the end of the book Simon meets an ancient being who knew the Creator, and gets an answer to his question. Winter is loitering in Kansas. 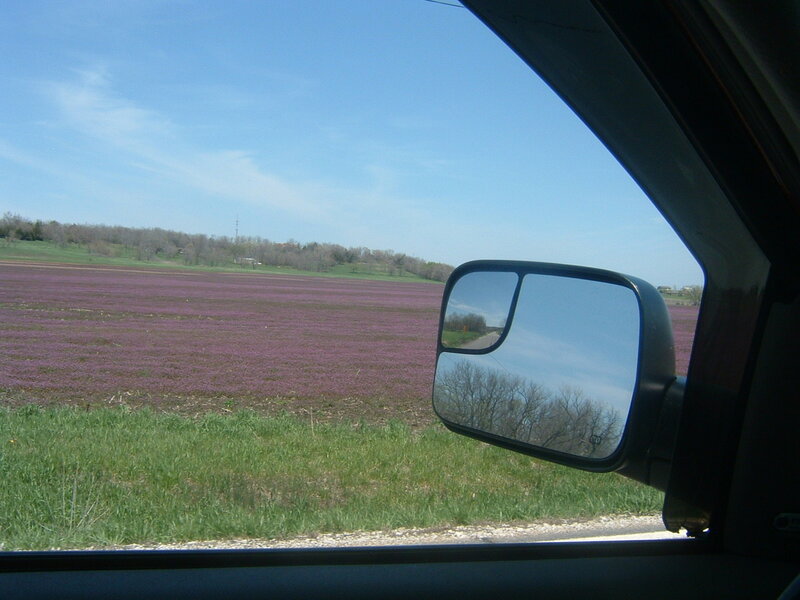 The henbit is fresh (that’s a field of it above). 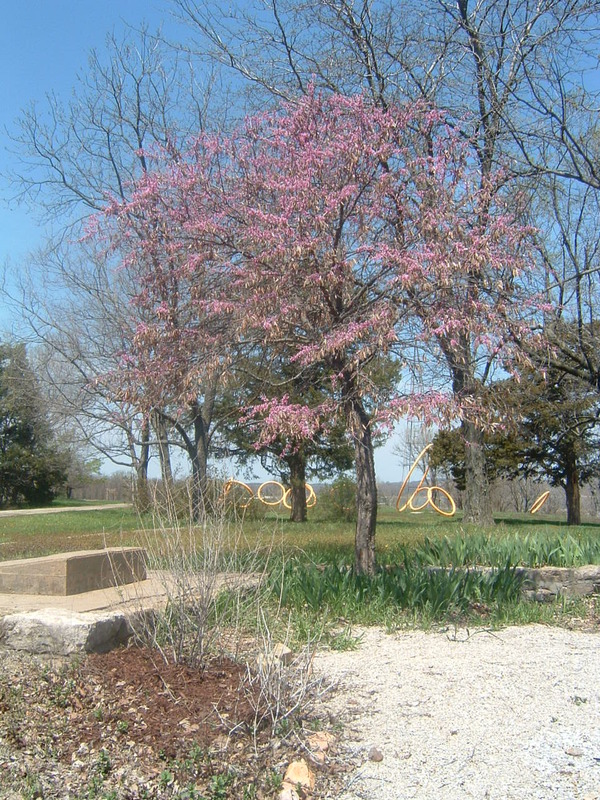 The redbuds are not yet in full bloom. The hardwoods are bare. We have one strong television network, and a good internet connection. We should pause for a few days.